Our zippered pouches are perfect for organizing all those small miscellaneous items that we all carry around in our backpacks, messeger bags, carry ons or even our totes and purses. These zippered pouches keep the essentials organized and easy to find instead of digging to find those small miscellaneous items. Our zippered pouches are available in two sizes - small: approx 8.5W"x6H and large: approx 12.5Wx8.5H. The pouches are made from a soft & durable canvas fabric that is printed on the outside with your design; the inside has a fused black lining. The printed canvase fabric is then cut and the pouches are sewn right here in the USA. You can design both the front and the back of the pouch - same design, two complementary designs or two totally different designs - the choice is yours! We offer many different personalization styles i.e. 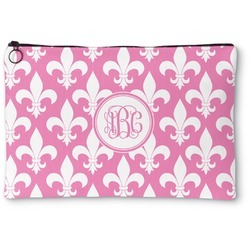 name, name & initial, monograms - so the choice to personalize is also yours. You may enjoy browsing our Luggage & Bags section and our office & desk accessories section. Product was just what I ordered. Thank you job well done, I received it yesterday. Reviewer: George W Manson Product: Dogs Playing Poker by C.M.Coolidge Zipper Pouch - Small - 8.5"x6"
Easy customizing, nice color and pattern choices. Just know that once you submit your customization, you can't change it--even 10 seconds later. Arrived very quickly. get an amazing number of complements. This bag receives lots of complements! 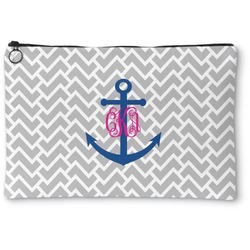 This cosmetic pouch is adorable, nice and roomy without being overly large for small to medium sized handbags. Easy to find in a large tote, also. Workmanship is excellent, quality is excellent, delivery of product exceptionally fast. These cases can be customized to your specific liking, and there's a huge variety of different options including fonts, patterns, and colors. I enjoyed the process of creating this item to meet my requirements. Inside, the bag has a solid color lining and the zipper is sturdy with a ring type pull on tab. Fabric is a pliable canvas; there's flexibility yet enough stiffness to retain shape. All in all, this was a completely satisfying experience, and I am a completely satisfied customer. I'm attaching some pictures to show the results, both front and back (which can be customized too).